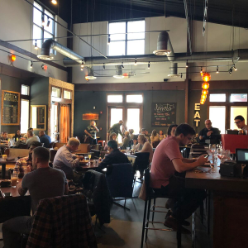 The Shed at Glenwood, the popular neighborhood brunch and dinner destination nestled in cozy Glenwood Park and Grant Park, is hosting an expansive Easter Brunch Buffet created by Executive Chef Quintles Swain on Sunday, April 21, 2019 from 10 a.m. to 4 p.m. Known for its intimate atmosphere, friendly service and seasonal offerings, adults and kids alike can enjoy an array of brunch favorites including shrimp and grits, spring duck hash, biscuits and chicken pot gravy, Gouda cheese grits; Deviled Eggs; Salmon; Brisket; Pastries; and much more. The Shed's Easter Brunch Buffet is available for $35 for adults and $15 for kids. For more information, visit www.theshedatglenwood.com/easter-2019.